Though I frequently walk in and out of WA State prisons, I find myself trapped in my internal prison much more often than I enjoy. It’s one I carry around with me and enter easily. Getting out can be an arduous process. The prison is my mind, specifically the part that spins stories about what other people are thinking, doing, intending or reacting to. I am amazed how frequently my brain can come up with a story and how often a story when checked out, can be way off base. I find I am not alone. Conversations I hear daily are couched in language that implies wrongness or diagnosis of others. When our stories are about others, we usually feel anger. When our stories are about ourselves, the feelings of shame, guilt and depression arise. The last time I was in the women’s prison I found myself on the receiving end of the stories. It was a very stressful weekend for the inmates. Mother’s Day events were being held. Try to imagine the stress of parenting from prison or the pain of not having contact with your children anymore. A higher number of fights than normal were breaking out, and most of the women who were trying to focus in the Freedom Project workshop I was co-leading were bundles of nerves. At one point on the second day, one of the women told me I was disrespectful, then another said I was being condescending, yet another one agreed and added I was just like one of “them” (the officers). They were sure their stories about me were true. Their evaluations were clearly facts in their eyes. I listened with empathy and was trying to find out what they had seen or heard from me that they interpreted as disrespect or lack of caring. I had asked two women to join me out into the hall first thing in the morning, to create safety, when I thought a fight was about to break out. I mediated between them for 45 minutes and the two women involved were thankful for the reconnection and learning. Some of the women who remained in the room, however, assumed I was somehow punishing the women I had asked out into the hall. It took empathy from my colleague and individual empathy from me with the angry participants during the following break to finally have my intentions for support, caring and learning seen by the women. We ended in a place of connection. The remaining hours of the workshop were spent giving empathy to the women for their pain and talking about the self-empathy that allowed me to stay present to myself in a way that let me hear their pain and not take their judgments personally. Judgments are simply tragic expressions of needs. I spent the next couple of weeks noticing when I didn’t stop to pause between something that triggered me (what someone said or did) and my story about it. Some of my stories are well rehearsed as I’ve practiced them for years. My belief in my stories can be as strong as the inmates’ belief in their stories about what they thought was going on in me. The freedom from the internal prison happens in that pause between observation and evaluation. I work through 3 steps that spring me loose. I find a way to notice what I’m reacting to the specific observation of what someone actually said or did. I pause long enough to look under my story (the evaluation) to my feelings and needs. I let a request naturally arise in relation to the needs I’m aware of. That pause is a place of choice and power. Separating observation from evaluation is a crucial first step to freedom. 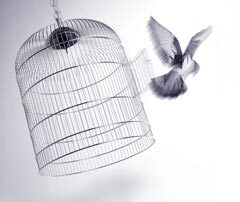 I find myself making that inner journey time and time again from my prison to liberation. It’s starting to get easier the more I do it. It requires compassion for myself along the way and trust that continuing on that path will lead to greater joy, clarity and connection.